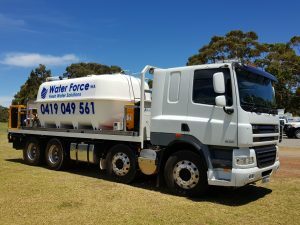 Water Force WA specialises in bulk water haulage to homes to meet your needs. Our fleet of tankers are licensed and insured to deliver throughout Western Australia. We can supply up to 27,000 litres in a single load with our truck and trailer combination and can supply up to 14,000 litres in one of our standard trucks. We offer quick and convenient water hauling to bring water straight to your door when you need it. domestic tank water testing by Valley Agribusiness and Environmental Services. A copy of the chlorine levels are available upon request so you know the water we’re delivering is of acceptable standard as per drinking water quality guidelines. Why spend days filling your tank or pool with a garden hose? Call Water Force WA on 0419 049 561 or 9525 3374 today to speak with our bulk water delivery expert or contact us today.